Quinn was five months old when I was diagnosed with Stage 4 breast cancer. 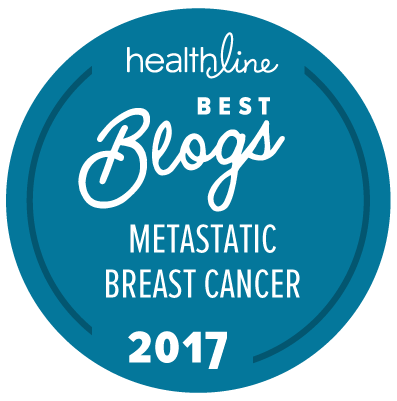 At the time, the statistics I could find (when I dared to look) said about twenty percent of people with metastatic breast cancer would make it to the five-year mark. I couldn't help myself; I equated that statistic with me having a one in five chance of watching my son start kindergarten. Kindergarten is still two years away. I am not there yet. But I am doing exceptionally well (knock on so much wood). Quinn started preschool this week, after a short summer break and at the same school he's been attending since last October. School -- if you can call it that -- is not exactly new for him, but he has a new teacher with new friends to make. We bought him a new lunchbox, green with dinosaurs on it. A lot of the moms of kids in Quinn's preschool are starting to chat about which school our kids will go to for kindergarten, and, slowly, I've found myself joining the conversation. I've spent the last couple of nights (crazy wild weekend here!) researching charter schools and open enrollment options for the public elementary schools in the districts next to ours. Although we love our house and neighborhood, we are nestled between two excellent public school districts. Ours, on the other hand, is just okay. I'm not sure I'm willing to accept "just okay" in a state with one of the worst public education systems in the country. A lot can happen in two years. Cancer is a sneaky and unpredictable beast, and I still live in three-month increments. But as I was reading about different charter schools' philosophies late last night, it dawned on me that -- sure enough, statistics be damned -- I am starting to make actual, real-life plans to be here for Quinn's elementary school years. I am letting myself believe this could really happen. We also bought Quinn a big boy bike this weekend. At REI, we couldn't get him off the darn thing. For at least half an hour, he wound his way expertly through tent displays and racks of clothing and the rock-climbing gear. He paused to check out the ropes hanging from the ceiling. "One sport at a time," I cautioned him as he tried to pull himself up by the carabiners. And then I caution myself because I don't want to jinx anything: one milestone at a time. As a stage IV mom, you have to be realistic and optimistic at the same time. It is very good that your medical condition gives you new hope to see Quinn going to school. And with your response so far (and many treatment options left) I think your chances are good. Yes, finding that balance -- between realism and optimism -- is always a challenge. I tend to veer on the side of optimism, even if that sometimes means I'm bordering on denial. As for the school search, I would say it depends on where you live. When we were in DC, some parents were looking at schools when they were still pregnant. Here in Phoenix, it's less densely populated and there isn't as much of a rush. I'm happy to hear your son is enjoying his school! I'm sure I'll be an emotional wreck when Quinn starts. I love this. It IS everything. Hugs, Nancy. The great thing about milestones is that, once you hit one, you feel like you're on a roll and you set another one. If these milestones include any combination of a child, a vacation, or simply comfortable moments with loved ones... even better! By the way... Quinn's helmet looks super fun! So true. I've also found that the more clean scans I've had, the further out I get comfortable making plans. Which probably explains why I'm daring to think about kindergarten, still two years away. And Quinn loves his shark helmet! Plans tell the world there is hope. Remember the breakthrough for HIV was sudden and dramatic. Exactly - so wonderfully said. Thank you for always encouraging me!